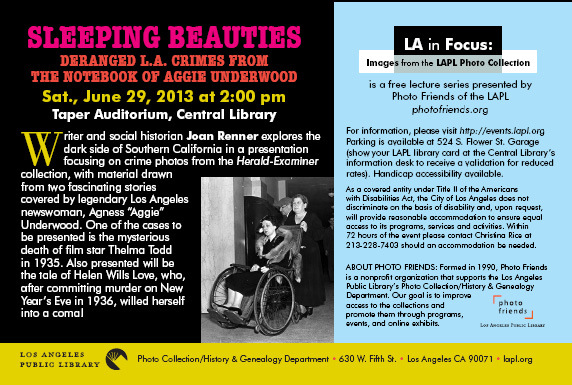 I’m giving a presentation this Saturday, June 29, 2013 at the Central Library in downtown Los Angeles. I hope you can join me! See below for information. This is the third of a series of articles by an International News Service staff correspondent who was enabled to obtain the first comprehensive inside story of California’s unique all-woman prison. Tehachapi, Cal., May 2 — Forbidden to read newspapers, their only source of information being occasional letters and visits by friends, the 145 women inmates of California’s “City of Forgotten Women,” Tehachapi, have one question that is always asked early during a visit. Anna de Ritas shot her lover to death. “Something new?” It was the first question asked me by Mrs. Anna de Ritas, 39-year-old convicted slayer of her sweetheart Mike Lotito. The dormitory in which she is housed is by far the “happiest” sounding building of the prison group. 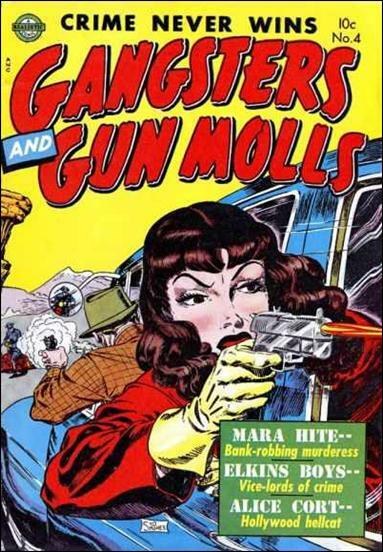 Thelma Alley killed a man with her car. Housed with her are Miss Thelma Alley, Hollywood actress, convicted of manslaughter in connection with an automobile accident; Mrs. Eleanor Hansen, who murdered the husband whom she charged failed to properly feed her and their daughter; Emma Le Doux, who has spent more than 20 years in state prisons for murder in Stockton. Another interesting inmate of Tehachapi, and another really happy one, is Mrs. Trinity Nandi who has spent more than 17 years behind prison walls for murder. She is to be released in May, and she is full of plans for the future. Since her removal from San Quentin to the Tehyachapi institution, Mrs. Nandi has been working in the rabbitry and has qualified as an expert. It is her hope to start a rabbit farm when she is released. 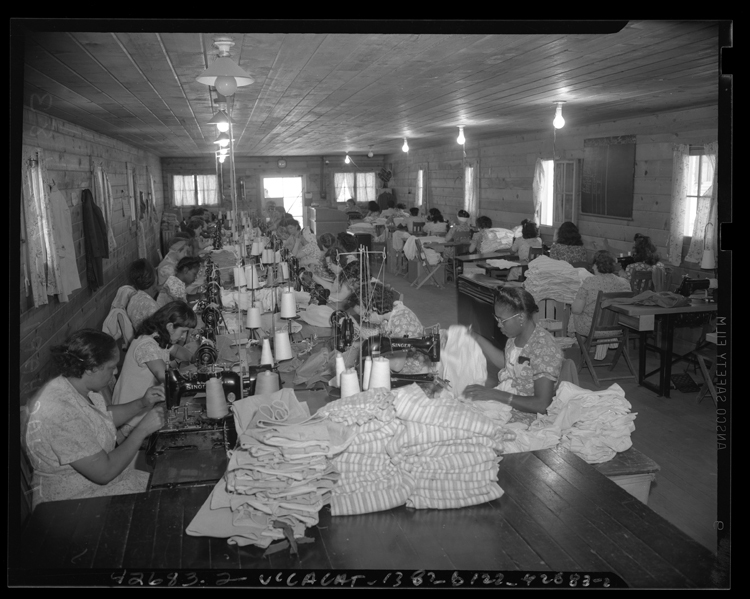 The women in Tehachapi are learning how to make themselves useful when they leave it. 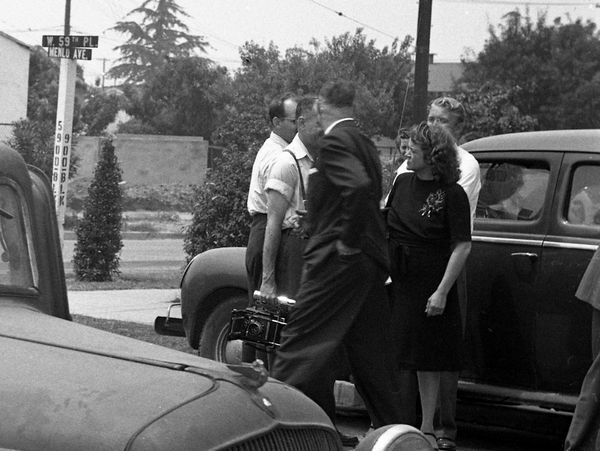 The girl the nation read out as the “jazz baby,” Burmah White, the blonde bandit moll, wife of one of Los Angeles’ most notorious slain criminals, Thomas White, has vanished. The “tough,” cynical 19-year-old girl who entered the prison 16 months ago has been transformed into a quiet mannered, sad-eyed girl, her face framed in soft dark brown hair which she had let grow back to its natural color. When Burmah first entered Tehachapi, she was full of ambition and conducted classes in commercial courses, Miss Josephine Jackson, deputy warden, says Burmah did a fine job of it. She taught oral English, typing, and dramatics to fellow inmates. She fell ill for almost two months and during that illness her ambition and vivacity seemed to disappear. “I’ve gone into it very thoroughly,” Burmah said softly, and sadly, after announcing that her interviewer was the first visitor she has had since last November. Her father, who was loyal to her throughout her arrest and trial, is dead now. “I wa an example to the youth of this country when I was sentenced for the wrongs I had done. That was the sole purpose in giving me that stiff sentence–to set an example. I wonder if it ha deterred any girls in Los Angeles from a life of crime–I doubt if it even made an impression on any of them,” she said bitterly. 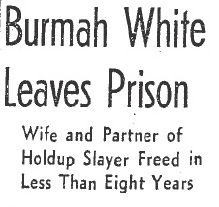 Burmah White may have lost hope for a while, but she was eventually released. She was only in her late 20s. Burmah hopes to be a writer. She started taking journalism instruction through a University of California mail course. I found she had been making a new blouse out of a bit of silk that she had managed to obtain. A particularly becoming blouse–peach colored, with a white lacing down the front. NEXT TIME: Meet Anna de Ritas and Emma Le Doux, two of the women in the “happiest” cottage at Tehachapi. This is the second of a series on California’s unique women’s prison, which has bestirred national interest among sociologists and penologists. 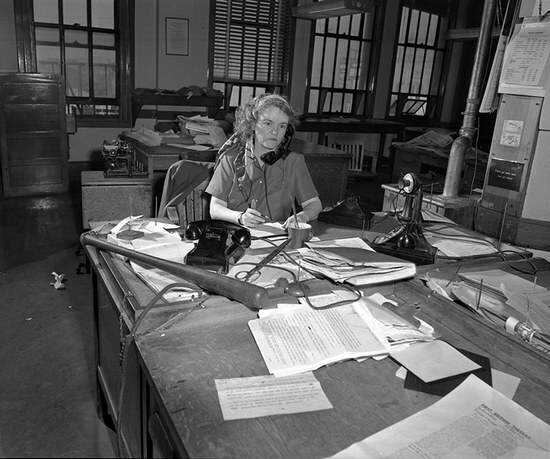 An International News Service staff correspondent was enable to obtain the first comprehensive “inside story” of the institution where Clara Phillips and other noted women offenders are now confined. Eight months in which to sit in one tiny room, forbidden to talk to anyone except matrons–Eight months in which to remember–what? Possibly the sound of six shots, ringing out in the still of night–six shots which ended the life of Eric B. Madison, movie studio cashier. 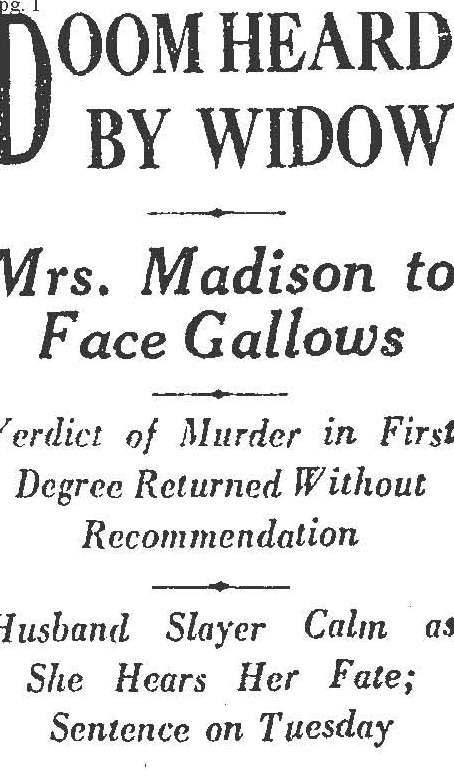 That is the fate of Nellie B. Madison, comely widow, who is the only woman in California now under sentence to die on the gallows. This “cell” is merely a room in the prison hospital. Architects who designed the state institution for woman at Techachapi omitted “death cell.” That’s another way this prison is different. So, in this room on the second floor of the administration building, Nellie Madison sits day after day. She seems a quite different person from the Nellie Madison who amazed Los Angeles court attaches during her trial with her cool calm demeanor. Her nattily tailored clothes are of course discarded for the regulation prison costume–blue denim dresses with a white pin stripe. Her jet black hair, now greying, has grown from the trim modern bob until it almost reaches her shoulders. “In Los Angeles, I was thoroughly benumbed by all that had happened,” she said after the first glad welcome of seeing someone whom she had seen in the outside world. 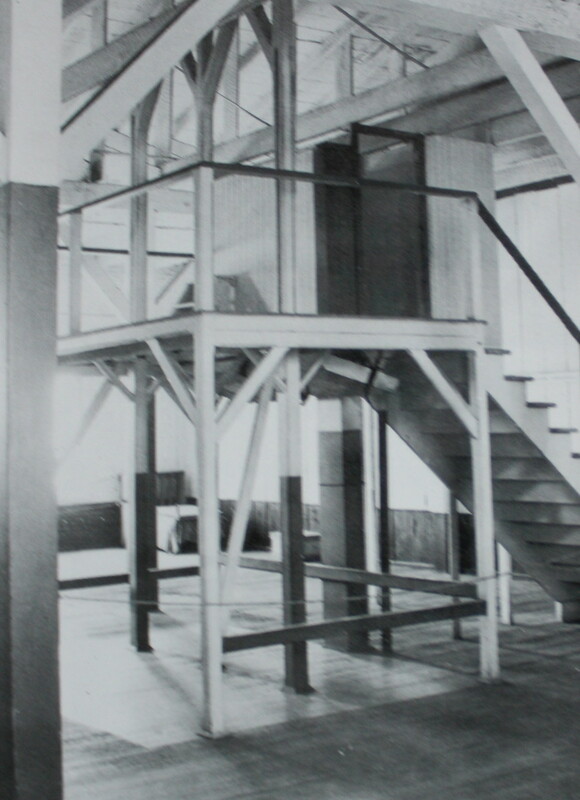 Gallows at San Quentin used from 1893 to 1942. 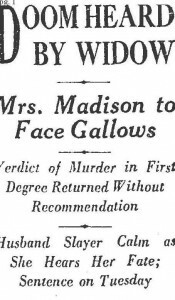 This was Mrs. Madison’s only interview since she has entered the state institution. “It seems to me that one’s conscience would be the greatest punishment in the world,” she said. Mrs. Madison’s recreation consists of short walks on the grounds each day–in company with a matron and the letters she receives from friends. 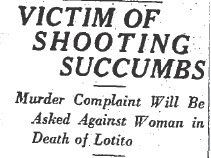 NOTE: After this series wraps up I’ll delve into the cases of a few of the women mentioned by Aggie in her articles. In the spring of 1935, Aggie Underwood wrote a three part series of articles for the Herald-Express on the women incarcerated in Tehacahpi. People have always been fascinated by the exploits of bad girls. There’s been a rise in the number of women committing violent felonies in recent years, but for many decades women behaving that badly were an anomaly. Alienists (psychiatrists) and penologists had various theories on the reasons why a woman might commit a crime as heinous as murder. 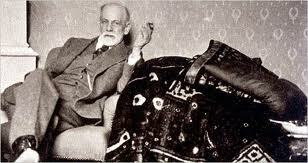 In 1924, Sigmund Freud suggested that menstruation reminded women of their inferiority and inflamed them toward revenge! Whether a woman killed because she was in a homicidal PMS rage or not, there was an ongoing debate on the punishment of women. Historically women have, quite literally, gotten away with murder. Dr. Bowers was a little confused about the facts of the case. 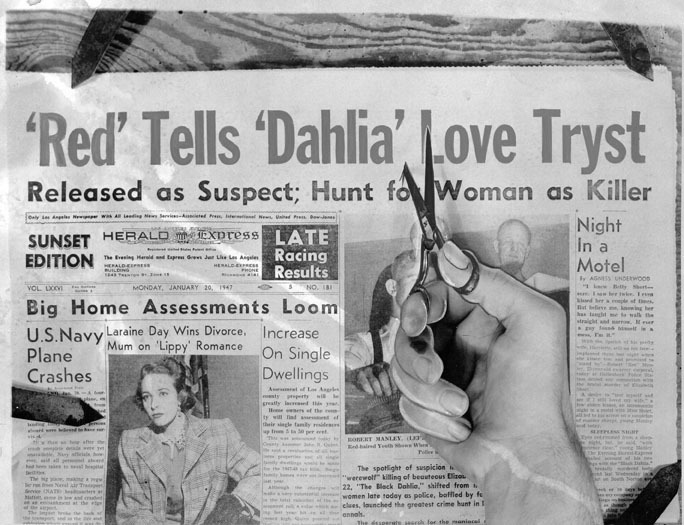 Ruth Snyder and her lover, Judd Gray, were convicted and executed for the murder of her husband; but Bowers was not at all confused about his opinion regarding female murderers — execute them! 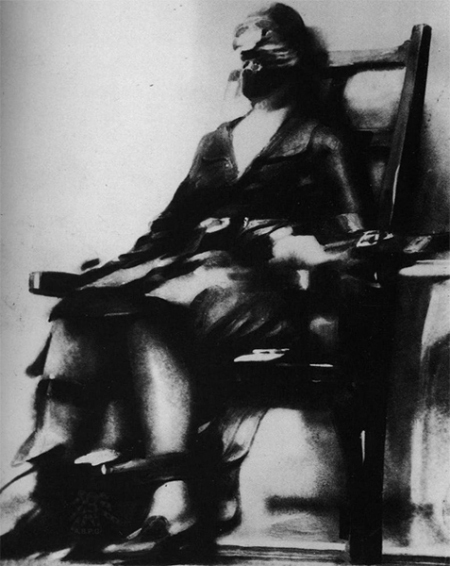 Ruth Snyder in the chair. As an aside, the Ruth Snyder/Judd Gray case inspired James M. Cain to write his powerful noir novel, DOUBLE INDEMNITY. 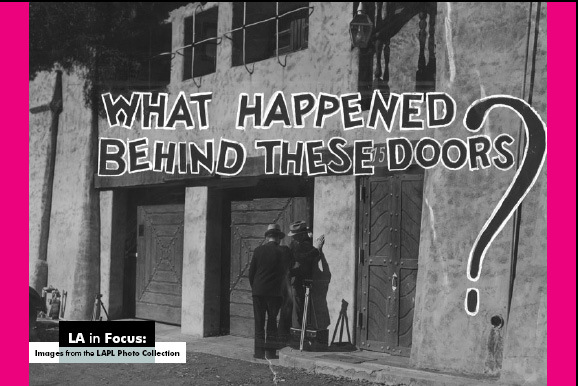 Below is the first part of Aggie Underwood’s series on the lives of the forgotten women of Tehachapi just as it appeared in newspapers in 1935. Nestled in a range of snow covered mountains, eight and one-half miles from the nearest town, is California’s home for forgotten women. Here are Clara Phillips, the celebrated “Hammer Murderer”; Louie Peete, Nellie Madison, Josephine Valenti, Anna De Ritas, Burmah White and 140 others who ignored man-made laws and are spending long, long years in a miniature city of their own. 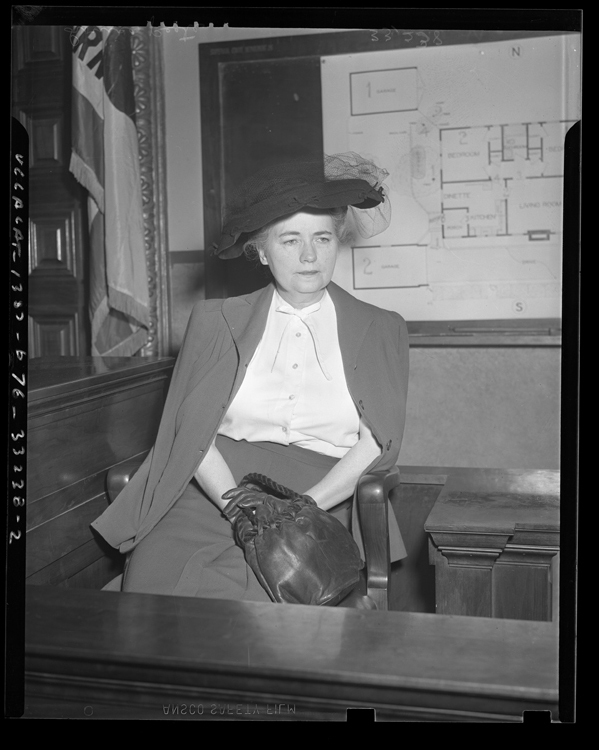 Ruller of this city surrounded by a high wire fence, is Miss Josephine Jackson, deputy warden, who works directly under orders from the head of the state prison at San Quentin, Warden James B. Holohan. For 18 years she has been employed in California prisons, and for 18 years she has been caring for women whom the state has tagged “bad” and sent away to do penance behind prison walls. Miss Jackson moved the first group of girls from San Quentin into Tehachapi in August, 1933, and by November of the same year all of the inmates of the state prison had been transferred. Life runs smoothly, and quietly, as the days go by with the only break in a monotonous existence being an occasional visit by some unexpected outsider. The buildings which comprise the prison group, are in an administration building, detention building and two cottages. All work in the prison is volunteer–none compulsory and each inmate is given an opportunity to do the work she likes best. Many of them prefer garden work, many laundry, many cooking and table serving, man secretarial and ome even beauty work. Six a.m. is regulation “get-up” time; 9 p.m. lights out. Work on the various necessary duties is started immediately after breakfast and groups may be een leaving the various buildings in which they are house for the rabbitry, the chicken yard, the barn yard where there are several cow to be milked. And, as groups gather around electric washing machines, or in the yard planting trees, or in the chicken yard, tending the fowls, loud shouts of laughter may be heard ringing through the echoing mountainous section. No supervisor stands over these 145 women to drive them to their tasks. No one waits around to scold or correct them. They are on an honor system to do their best, work in their best manner, and according to Miss Jackson, this system succeeds remarkably. Each building has a nicely furnished recreation room where the girls gather when their daily tasks are completed, to play cards, checkers, sew or play the piano. But, because the architects failed to provide for an auditorium, there are no picture shows because there is no room large enough to seat all the inmates. Just as Sing Sing, the famous eastern prison for men has its outstanding football team, so does Tehachapi have its baseball team. In fact, two teams have been organized, Joephine Valenti, who gains prominence in Los Angeles when she was convicted of burning her small baby to death, is captain of one team and Pauline Walker, a colored girl, is captain of the second team. The play every Sunday, with all of the inmate gathering on the sidelines to do the rooting. At preent the field isn’t much good, but the girls are gradually doing their own work and making a real diamond. They have made their own uniforms–white bloues and black bloomers with red stripes down the sides, and, according to Miss Jackson, they welcome the opportunity to don these costumes and break the monotony of every day life. Each goes on in the same fashion, light tasks, few laughs–a drab life, for the 145 women who must pay for their trangresoins of the law. yet Tehachapi represents notable changes in the American penal system and is being studied as a model. 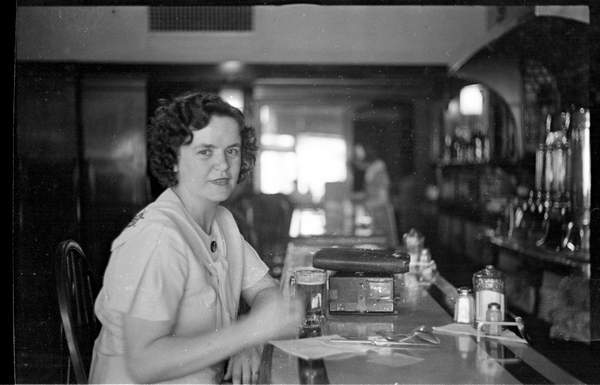 NEXT TIME: Agness Underwood’s series on the “city of forgotten women” continues.